A recent item at The Onion, the online humor site which is now rarely genuinely funny, claimed that "Fearful Americans (Are) Stockpiling Facts Before (the) Federal Government Comes To Take Them Away." Naturally, it was occurring because Americans are "alarmed at the prospect of unconstitutional overreach by the Trump administration." Ha-ha-ha — as if "constitutional overreach" didn't occur at a record pace during Barack Obama's eight years in office (yes, it did). It would appear that those of us who are alarmed at the genuine power-grabbing overreach seen at the titans of tech and at social media companies really need to start stockpiling dictionary entries relating to important words so we can store and retain their real meanings. One alarming example of this need has been delivered by Google's search engine. Google's current dictionary definition of "fascism" returned in searches on that word now limits its application exclusively to "right-wing" governmental systems and views. The limited available evidence indicates that the search behemoth changed its definition last year just before Donald Trump clinched the Republican Party's presidential nomination, and that the web site has been directly associating Trump with fascism in its search results for well over a year. Google's justification for this unilateral limit in the definition of the word it provides to U.S. users is very thin. 1. any ideology or movement inspired by Italian Fascism, such as German National Socialism; any right-wing nationalist ideology or movement with an authoritarian and hierarchical structure that is fundamentally opposed to democracy and liberalism. 2. any ideology, movement, programme, tendency, etc, that may be characterized as right-wing, chauvinist, authoritarian, etc. British Definition 1 appears to assume that Italian Fascism and the German National Socialism initially modeled upon it were right-wing in nature. The left has tried to perpetuate this false narrative since World War II. 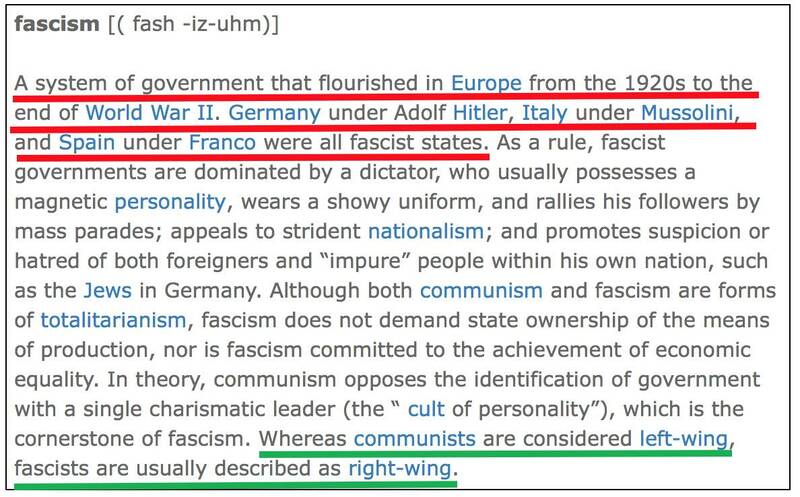 The facts clearly show that Italy under "hardline Communist Benito Mussolini" and Adolf Hitler's Nazi Germany were authoritarian left-wing governments. This bogus recasting of history, which has until recently been limited to far-left academics and pundits but has now gained wider credence, directly contradicts reality. In his 2009 book Liberal Fascism, Jonah Goldberg reminded the world of several inconvenient truths the left hates to admit, namely that "the original fascists were really on the left, and that liberals from Woodrow Wilson to FDR to Hillary Clinton have advocated policies and principles remarkably similar to those of Hitler's National Socialism and Mussolini's Fascism." British Definition 1 has a bonus for lefties, in that its final sentence gives believers in "liberalism" permission to call anyone who opposes them "fascists." Definition 2 also gives anyone permission to call anyone on the right a "fascist." Both elements of Dictionary.com's British definition are absolute, beyond-the-pale rubbish. The definition's reference to communism's opposition "in theory" to having a "charismatic leader" is a sick joke. Apparently someone forgot to tell the dominant communists of the past century who have ruled on the basis of their personality, including Fidel Castro, Josef Stalin, Pol Pot, Ho Chi Minh, Mao Zedong and others, about this theoretical contradiction. Returning to Google's definition, there is some evidence from forum posts (here and here) that Google changed its definition of "fascism" in May of last year after having previously employed the primary Dictionary.com version. The forum posts indicate that the change was made on or about May 23. Donald Trump clinched the Republican Party's nomination for President on May 26. If the change-date references in those posts are correct, that's quite a coincidence, going into what was obviously going to be an intensely contentious 2016 presidential campaign. For those who believe that Google is above wordsmithing and manipulation in the name of politics, Stephen Moore at Townhall observed in December of 2015 that "If you Google 'fascist,' the first thing that pops up on the screen is a photo of Trump." During the 2016 presidential campaign, Google was credibly accused of rigging its auto-suggest feature to limit the visibility of Hillary Clinton's health problems after a New York Times reporter complained that rumors about her health came from "conspiracy theorists." The key point made during this controversy was that the auto-suggestions at other search engines were far more logical in completing partially entered search terms. Political conservatives advocate for small, less intrusive government where power rests with the states and individuals, and the federal government lives within its Constitutional restraints. Progressive liberals advocate for just the opposite: a powerful central government with authority vested in a strong leader who has the ability to impose decrees from Washington on everything from health care to education. Google curiously adds “right-wing” to its definition and omits the “severe economic and social regimentation, and forcible suppression of opposition” part. By the traditional Merriam-Webster definition of “severe economic and social regimentation, and forcible suppression of opposition,” the violent mobs protesting and rioting over President Trump’s actions are the ones engaging in fascistic tactics. ... Many members of the mainstream media have unquestioningly adopted the new Google meaning without explaining why, leaving their audience with the impression that speech or advocacy contrary to liberal orthodoxy is fascistic when, by definition, it is not. At the very least, Google's move, whenever it happened, has been quite convenient for leftists and their media friends who want to justify how they label their political opponents.